The Visitor Dock is available for short-term moorage on a first-come basis. The payment box is located at the top of the boat launch ramp. For credit card payments, please come into the Port office during business hours of 9:00 am – 5:00 pm, Monday – Friday. 30 Amp electrical service is available in areas of the visitor dock. The visitors dock, boat ramp, and parking lot are projects of the Oregon State Marine Board. Marina fueling is operated as a concession by the nearby Shell Station, who sets the price per gallon. Hours of operation are 8:00 AM – 6:00 PM all days. Diesel and non-ethanol blended gasoline are available, and payment is by credit card only. 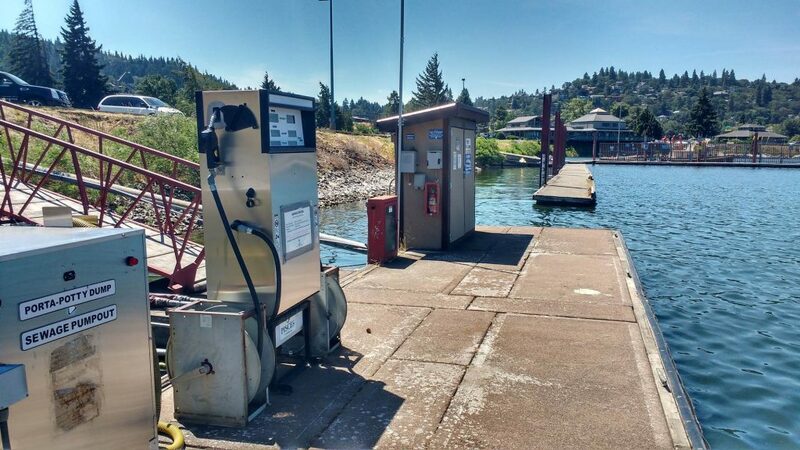 Please use the phone on the fuel dock that is located on the outside of the building to the south of the fuel pump, or call (541) 387-5544 and an attendant from the Shell Station will be on-site to serve you within 15 minutes. The pump out station is self-service only, and located next to the fuel pump. The Hood River Marina guest dock and fueling station located at River Mile 169.